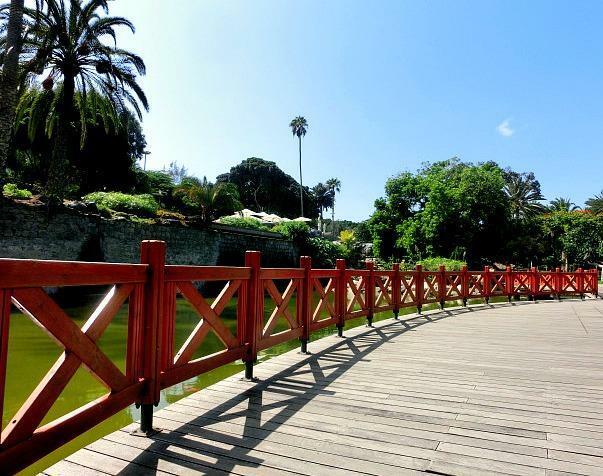 If you're suffering from greenery withdrawal symptoms on your visit to Las Palmas de Gran Canaria, get your fix at Parque Doramas. 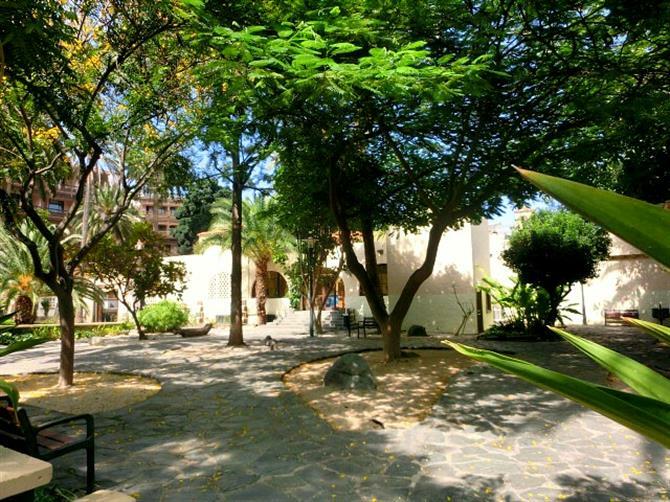 Centrally located, it's close to the Pueblo Canario. So you can go from the village to the green in no time at all. Enter Parque Doramas from the Avenída Tomás Morales and you'll soon see its first water feature. Doramas Park was originally a zoo but the majority of its wildife now reside in this pond. The koi carp, of the brightly-coloured variety, are the monsters of the not-so deep here. Continue walking and you'll hear the distinctive croaks of frogs. Depending on when you time you visit, you might see tadpoles as well. Also look out for brightly-feathered birds flying above your head. 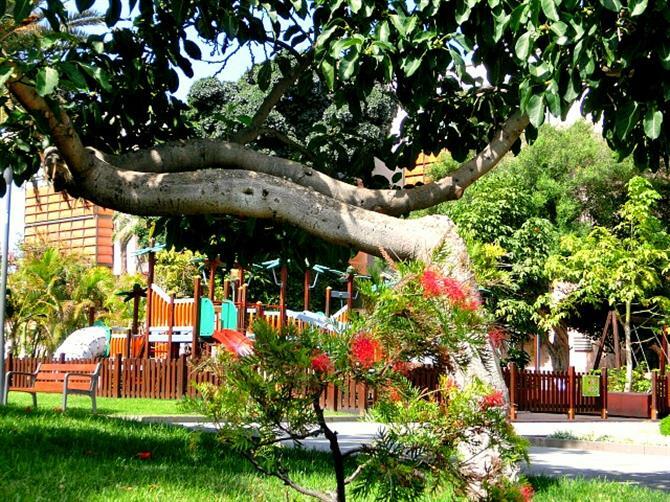 Parque Doramas boasts not one, but two playgrounds. During the week, they're largely empty and are mainly used by local schools as part of what would appear to be a games lesson. They're more popular at the weekend, particularly on Sundays. The larger playground, appropriately enough, is aimed at big kids, although that doesn't mean you, mums and dads. There are climbing frames, slides, and swings for your not-so-little darlings to run around on. The smaller playground targets baby and toddlers with the swings here enabling you to safely strap your tiny ones into them. The main reason why the playgrounds are busier on Sundays is because of the free children's show which typically starts at 12:00pm. Never exceeding an hour, these are sweet, short affairs. Performers know they're dealing with an audience dominated by those with a short attention span i.e kids. If it's a particularly sunny day, you can seek shade under the giant tree which overlooks the seating area. And because of Las Palmas de Gran Canaria's enviable climate, rain rarely stops play here. Expect to see clowns, magicians, or a puppet show. For peace and quiet plus even more shade, head to the Rincón Oriental. 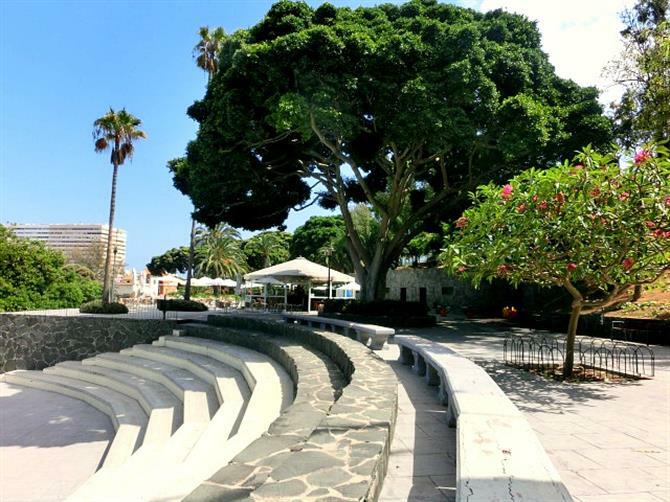 Although on a Thursday afternoon and Sunday morning, you'll be able to hear the folk music performances from the neighbouring Pueblo Canario. At other times, though, it's a great place for a spot of unhurried contemplation. And if you get a little bored, you can always try and trapeze your way across the decorative tree trunks. Otherwise, read the book in a location you're not going to be distracted in. The Rincón Oriental: the perfect chill-out zone. Explore our 12 favourite and essential must-sees while visiting Las Palma de Gran Canaria! Are you a hipster? Looking for places to go to in Las Palmas de Gran Canaria? You've come to the right place. Get lost in Las Palmas de Gran Canaria by visiting La Isleta. A living, breathing neighbourhood where you can meet locals. Yes, time to go native. The Caldera de Bandama's a rewarding hike on Gran Canaria. Trek down to the bottom of the caldera before ascending. What goes down must come up.